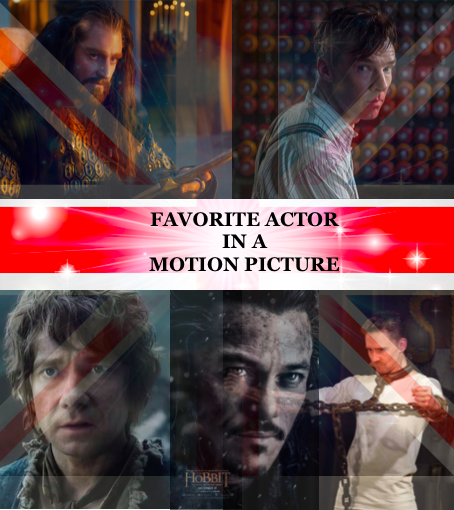 Nominations for the 2015 Anglophile Channel Awards were announced in Los Angeles on New Year’s Eve and leading the pack is Britain’s most popular export, Benedict Cumberbatch who is nominated in three categories: Favorite Actor in a Motion Picture (The Imitation Game), Favorite Actor in a Television Series (Sherlock) and Favorite British Artist of the Year! Cumberbatch is coming off another amazing year having already won The Emmy for his popular portrayal of the title character in the hit BBC series, Sherlock, and is now receiving Oscar buzz for his role as Enigma-code breaker Alan Turing in The Imitation Game. Tickets for Cumbertach’s 2015 West End production of Hamlet sold out in minutes all while he was before the cameras with even another Shakespearean outing as Richard III. Add to that a whirlwind year of worldwide travel and press stops at talk shows, red carpets and magazine covers and it looks like Cumberbatch is the man to beat in every race. Also leading the TAC nominations is last year’s Favorite British Artist of The Year recipient Richard Armitage with two nominations. Armitage is coming off an equally impressive year having appeared in two major studio films for Warner Bros: Into The Storm and the world’s current #1 film Peter Jackson’s, The Hobbit: The Battle of Five Armies, in which his performance as dwarf king, Thorin Oakenshield, is amongst the most lauded of the whole series. Armitage also received rave reviews, and pre-Olivier Award-buzz, as John Proctor in the critically acclaimed West End production of Arthur Miller’s The Crucible at The Old Vic in London. In between rehearsals and press junkets, Armitage managed to fit in starring roles in two indie-films and a cameo in yet another major studio film. Richard Armitage could be on the verge of a major Hollywood career and we can always say we gave him his first award! Also enjoying an impressively successful year is Armitage and Cumberbatch’s Hobbit co-star, Martin Freeman, who also landed TAC nominations in both the Favorite Actor in TV and Film categories. A recent Emmy award winner for his role as John Watson in Sherlock as well as his Emmy-nominated turn as Lester Nygaard in Fargo…add to that headlining all The Hobbit films, while starring in an unforgettable West End production of Richard III and you have another talented British export that we’d love to see more of! Rounding out Favorite Actor in a Television Series is Sean Bean (Legends), David Tennant (Broadchurch/Gracepoint) and newcomer Sam Heughan (Outlander). In the Favorite Actress in a Motion Picture category Keira Knightley (Imitation Game), Helen Mirren (Hundred Foot Journey), Emma Thompson (The Love Punch) and Emma Watson (Noah) are all no surprise as these ladies are solid artists who always turn in great performances in each of their films. Emily Blunt’s incredible turn as The Baker’s Wife in Into The Woods is what has many people a buzz in Hollywood. In the current hit movie musical, Blunt shows off a incredibly beautiful voice that few people knew existed. Already nominated for a Golden Globe…can a TAC Award be in her future? The stand-outs in this year’s nominations voting has been Outlander break-out stars, Sam Heughan and Caitriona Balfe. Relatively unknown prior to the debut of their STARZ series in 2014, Heughan and Balfe have amassed a fandom of supporters as impressive as any of our veteran artists…making this year’s race to the TAC Awards a real nail biter! This entry was posted in Lady Anglophile Reviews & Other Bits and Bobs, The CumberWatch and tagged Benedict Cumberbatch, Caitriona Balfe, Keira Knightley, Luke Evans, Martin Freeman, Outlander, Richard Armitage, Sam Heughan, The Hobbit: The Battle of Five Armies. Bookmark the permalink.